Sorry it has been a very quiet few months around here. There’s been big changes a foot (which I will tell you all about next time), coupled with a bit of a medical emergency which had me out of cooking action for quite a while. But don’t worry, I’m back and have so many recipes half written ready to post for you. Our organic delivery this week was full of lovely spring vegetables including some broad beans and fresh tender rocket (I’m secretly pleased to see the end of the cabbage and leek glut). The meat box included 2 smallish chicken breasts skin-on amongst other goodies. I had a bunch of sage left; I had already used some of to make more vegetable stock paste, some had gone in with the Varoma ‘roast’ beef the day before but I was looking for a reason to use some more of it up. It’s school holiday’s this week and on a whim I took the kiddies to “Bill’s” for lunch, just the three of us. Whilst enjoying some really really nice sea bass (pan fried with potato rosti, avocado, cherry tomatoes and capers, lovely combo) I spotted a broad bean risotto with sage on the menu. I thought I can do that as I just happened to have those two things on hand, and then I added a bit extra. You can of course not worry about the chicken and just make the risotto, it is equally delicious on it’s own. For dairy free you can omit the cheeses but I can’t promise it will be quite as flavoursome on this occasion. The fetta in particular adds a little je ne sais quoi! The broad beans came in the pods. I had already shelled them all and popped them in the fridge. The previous night I did a few in the pan with bacon lardons, garlic and tomatoes but while the flavour was nice the skins were too tough and I got messy fingers peeling them on my plate after cooking. I didn’t make that mistake again and this time I blanched them quickly first and removed the skins. All up this recipe looks like quite a handful, there is a little bit of manual prep required outside of the standard ‘throw it all in’ style thermo-risotto, but it is worth every extra second you spend before you start cooking I promise. 6-8 Fresh Sage leaves, roughly chopped. Extra nice EVOO for drizzling over (try Kalamata EVOO if you can find it). Actually it’s not that bad, but if you get these little steps done first it will all go very smoothly. You can buy these fresh or frozen, fresh is best obviously but any port in a storm. If they’re in pods, pop them out. Boil a small pot of water and once boiling drop the lot in, allow to boil for 1 minute then quickly drain and run under cold water to stop the cooking process. When they cool the skin will wrinkle up. If you’ve got lots go ahead and blanch them all now. Then just peel the ones you need for this recipe. To peel them nick the skin with a sharp knife, tear it back and pop out the internal bean. Set aside. With frozen broad beans blanch them from frozen for a shorter amount of time. Then when you cut the skin you can just squeeze them and the frozen bean pops out. Because it is still a bit frozen it is hard and doesn’t get squashed. The drawback I have found with frozen ones though is that they are tiny so you twice as many and it takes longer to peel them. Of course if you don’t mind the skins just skip this step altogether. Toast them in a small pan until slightly golden. Keep an eye on them and pour them into a dish as soon as they’re starting to brown as pinenuts burn quickly. Set aside. Don’t worry about washing the pan right now, you will use it for the chicken. Line your Varoma with a piece of wet scrunched up baking paper. 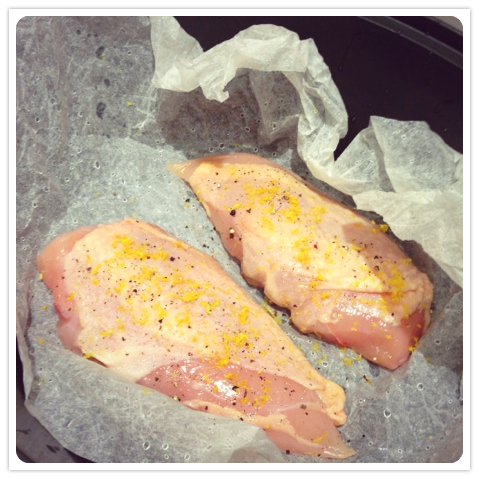 Place chicken skin side up on paper, season with salt & pepper and sprinkle with half of the lemon zest. Place lid on top and set aside. If you are using the chicken for this recipe you will pop the varoma on top at each cooking step, this helps to begin to warm it so that the chicken will have completed cooking when the risotto is ready. You can either grate it in the TM using turbo or quickly using the same plane you used on the zest. Set aside. Place 1 clove of garlic in the bowl, chop 5 seconds, Speed 5. Add 1/2 a brown onion, chop 4 seconds, speed 5. Scrape down. Add 20 grams of olive oil, (place varoma with chicken on top), sauté 5 minutes, Varoma temp, Speed 1. Add 250 grams of arborio or pudding rice, and 200gm dry white wine (place varoma with chicken back on top). Cook 2 minutes, Varoma temp, REVERSE Speed Spoon. Add 450 grams Chicken Stock, stir with a spatula to ensure no rice is stuck to the bottom, place varoma with chicken on top, cook 11 minutes, 100 degrees, REVERSE Speed Spoon. Whilst it is cooking heat up your small pan again. When the 11 minutes is up carefully remove the Varoma and place the chicken, skin side down, into the hot pan to crisp. Meanwhile, stir the parmesan, pine nuts, rocket, broad beans, remaining lemon zest, lemon juice, and sage leaves into the risotto. Cook a further 1 minute, 100 degrees, REVERSE Speed Spoon. To serve, sprinkle crumbled feta over the top of the risotto, drizzle with a little EVOO thinly slice the chicken and place it alongside. This entry was posted in All-In-One meals, Mains and tagged Broad bean, Chicken, fetta, gluten free, Lemon, pinenuts, recipe, risotto, Sage, Spring, Thermomix, Varoma. Bookmark the permalink. Yum, yum, yum! This looks lovely, Kirrin! We have planted broad beans in the garden this year and I can’t wait for them to mature. In France, broad beans are called Coco beans and they are just starting to show in the local farmers’ markets so guess what’s on my shopping list now? Thanks for sharing! I love broad beans. They are much derided, probably from days when they were served over cooked in a big flavourless heap. But when they are fresh and only al dente, with the right flavours they’re delicious. I grew a giant crop a few years back as they’re meant to be very good for the soil as a ‘green compost’, they put back nutrients. That’s when I discovered that they’re also tasty.